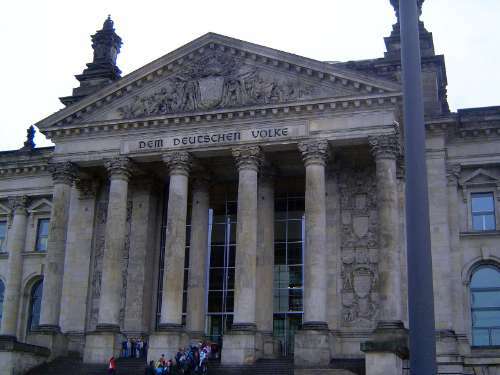 German architects were second to none in their devotion to classical architecture. 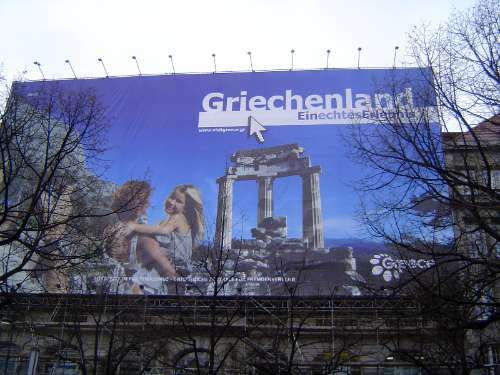 Here, from Berlin, is proof. 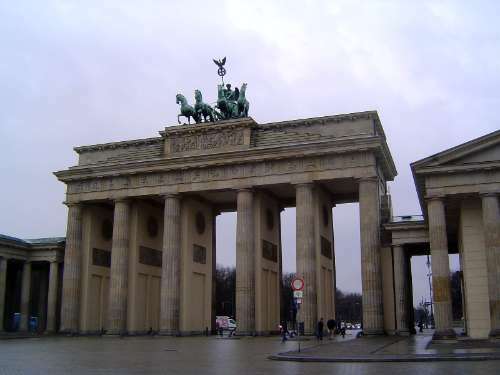 The Brandenburg Gate, originally a gate in the long-vanished Berlin city wall, was designed by the self-taught Carl Langhans. It's a dead-ringer for the Propylaea, the famous entrance to the Acropolis. The bronze figure up top is of Nike in her quadriga, a four-horsepower chariot. It was added in 1793, two years after the masonry below was finished. (Comparable ensembles can be found in London's Wellington Arch, the Arc de Triomphe in Paris, Rome's Vittorio Emanuele Monument, and vestigially in the horses of St. Mark's, in Venice.) The gate was destroyed in World War II, so the gate today is a reproduction, including a recasting of the statue. For almost 30 years the Berlin wall of 1961 blocked the gate. 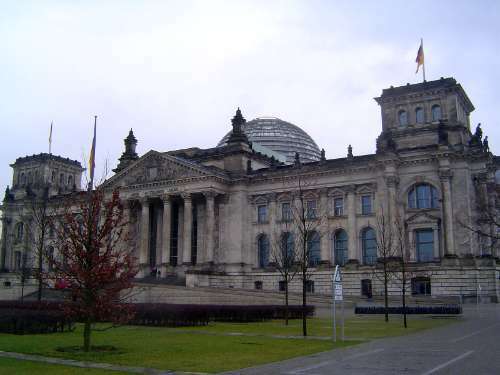 Next door to the Brandenburg Gate, and almost symmetrically placed against the U.S. embassy, this is the German Parliament, the Reichstag, completed in 1894 to a design by Paul Wallot. Norman Foster's recent dome over the Plenary Hall replaces the original dome, also of glass and steel and equally avant garde in its day. The inscription--"To the German People"--was added in 1916 over the objections of the Kaiser, who had no time for democratic tomfoolery but who, in any case, wouldn't be around much longer to object. 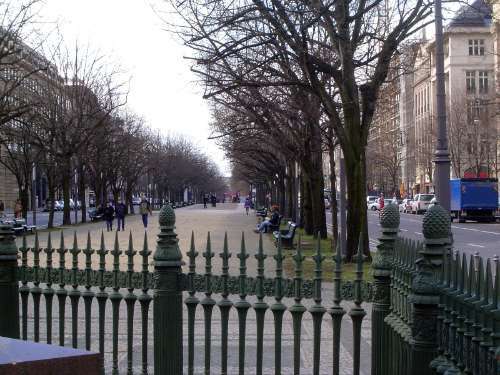 Stretching east from the gate is the famous avenue called Unter den Linden, Under the Lindens. 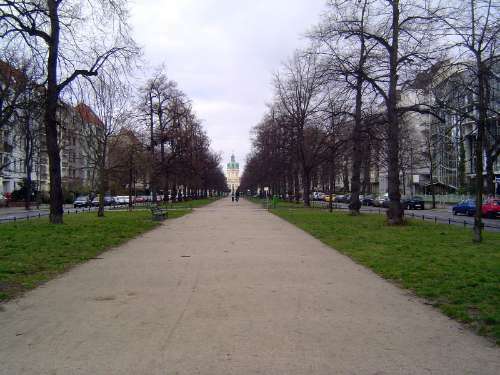 Created in 1647 with a nod to the Rome of Sixtus V, it seems to be Europe's first avenue deliberately planted with trees. 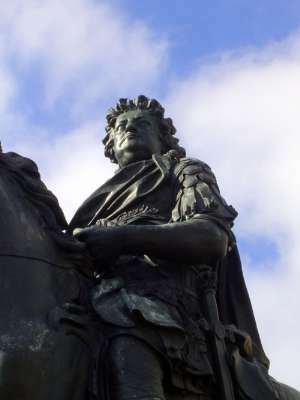 Friedrich Wilhelm III, King of Prussia from 1797 to 1840, keeps an eye on the traffic. Despite the grand pose, his career began with a loss to the French at Jena, proceeded to sycophantic subservience to the Russian Tsar Alexander, and continued downhill. 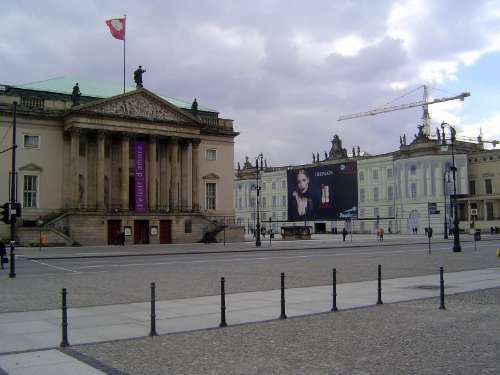 A two-minute walk south of Unter den Linden is a large square, the Gendarmenmarkt, punctuated with matching cathedrals--German and French--from about 1700. They, too, like the Brandenburg Gate, the Reichstag, and just about every other monument of imperial Berlin, were rebuilt after 1945. 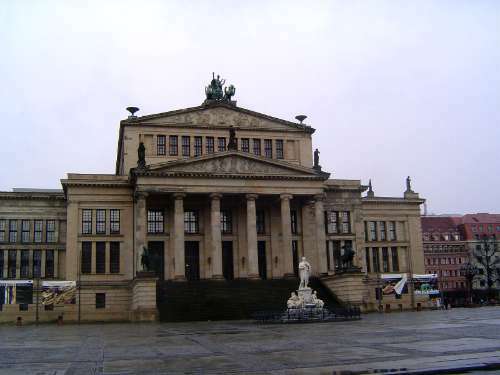 Between them stands the Schauspielhaus, completed in 1821 as the Royal Theater (after 1919 the State Theater) to a design by the hugely influential Karl Friedrich Schinkel. It, too, was rebuilt, in its case in the 1980s. Another Schinkel project, the Neue Wache or New Watch guardhouse of 1818. 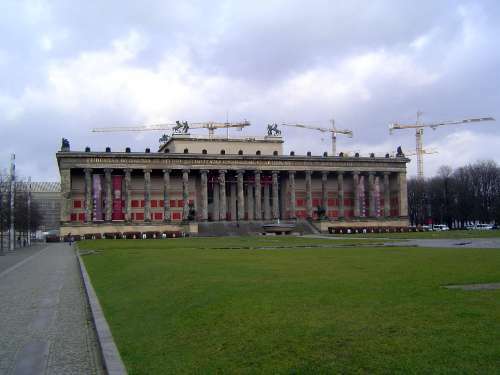 It became a war memorial in 1931 and is now the Central Memorial of the Federal Republic of Germany. 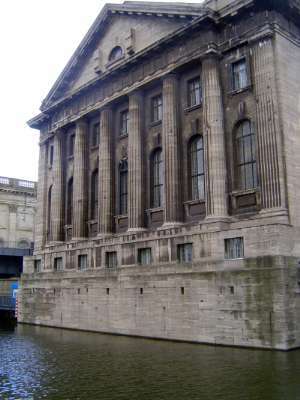 Yet another Schinkel: the Altes Museum or Old Museum, 1830. 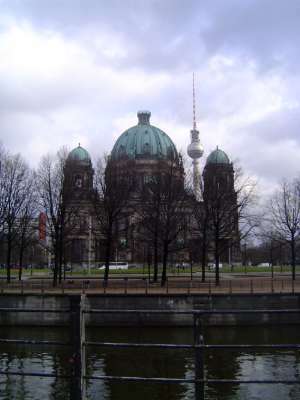 The Berlin Cathedral, built 1895-1905 to a design of Julius Raschdorff, is sometimes called a Protestant St. Peters. 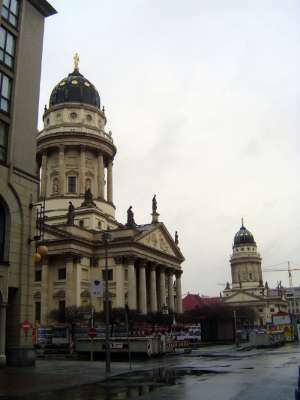 It, too, was rebuilt after the War, in this case with lower and simpler dome than in the original. Peering over its shoulder is the Fernsehturm or television tower, from the 1960s. 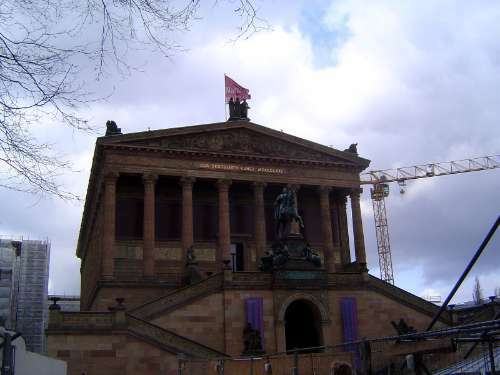 Behind the Altes Museum is the Alte Nationalgalerie, the Old National Gallery of 1861. 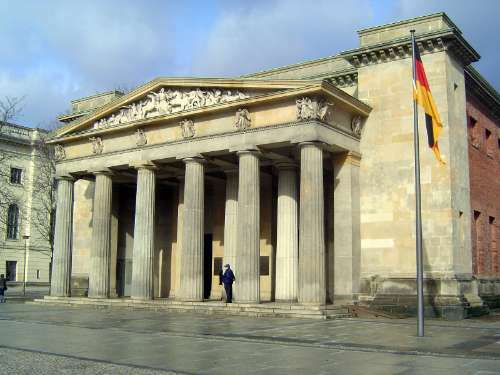 Behind the Old National Gallery is the Pergamon Museum, completed in 1930 on the principle that what was good enough for Friedrich Wilhelm in 1830 was good enough for the Weimar Republic. Back on Under den Linden, this is the Statsoper Unter den Linden, the state opera house built in the 1740s, rebuilt after a fire in 1843, and rebuilt again in the 1950s. It's good to see the Guerlain sign covering the Alte Bibliothek or Old Library: why should Americans be the only ones to endure the privatization of public space? 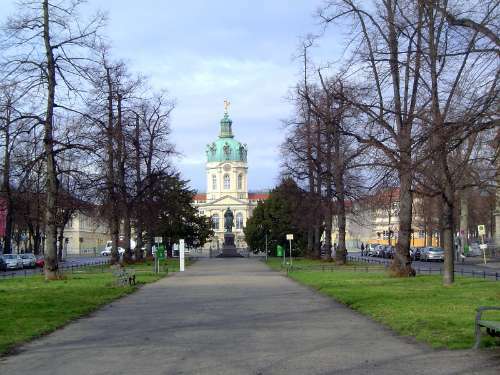 We've jumped just under six kilometers west of the Brandenburg Gate to look north along the Schlosstrasse to the Schloss Charlottenburg. The equestrian figure in the previous picture was Prince Albert, or Albrecht, 1809-1872, Prince of Prussia and colonel general, who died in the Franco-Prussian War and is buried in the mausoleum behind the palace. 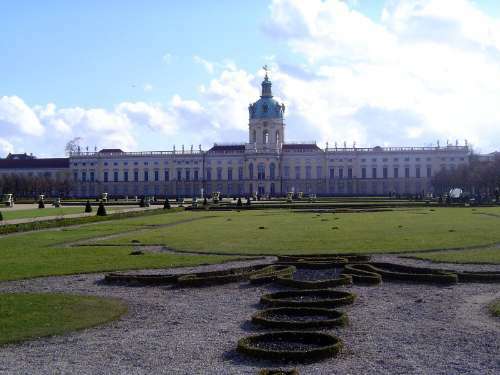 The palace was the retreat of Queen Sophie-Charlotte, the wife of Frederick I. It was small in her lifetime--she died in 1705--but later grew vast. Despite the image of Fortune at the top, the goddess didn't always smile. 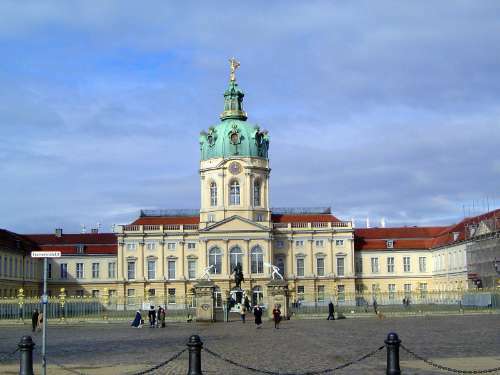 The palace was rebuilt after 1945. In the courtyard, by Andreas Schluter, there's an equestrian image of Charlotte's husband, Friedrich III, Elector of Brandenburg. 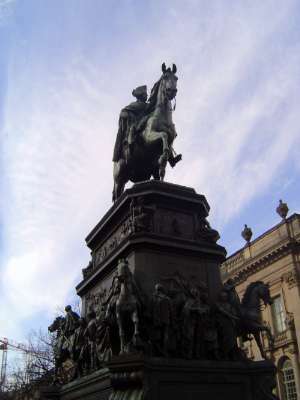 After 1701 he became Friedrich I, King in Prussia. The name change meant that he occupied a numerically bizarre position as a Friedrich wedged between Friedrich I (the Great Elector) and Friedrich II. 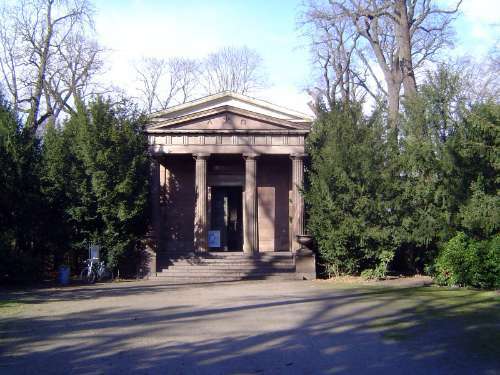 Off to one side of the garden is the Hohenzollern Mausoleum, built as a Doric temple in 1810. It was Schinkel's first work. 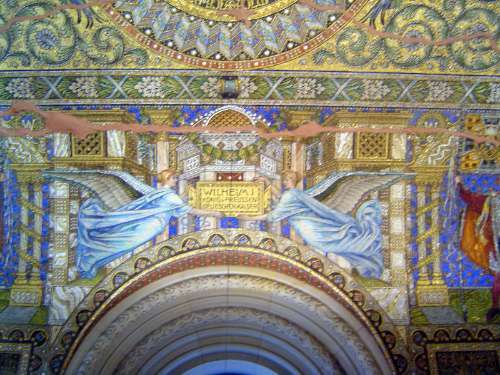 Built originally as a mausoleum for Queen Luise, it also contains the tomb of Kaiser Wilhelm, who died in 1888. 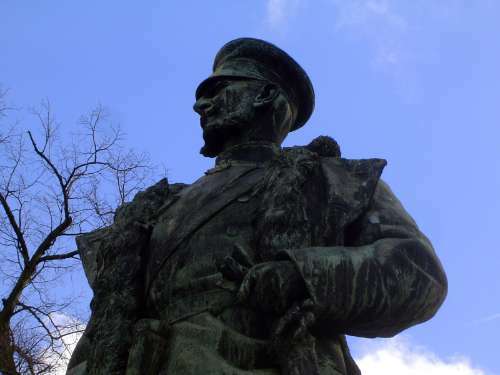 Kaiser Wilhelm II is not here; he's in the Netherlands, where he died in exile. 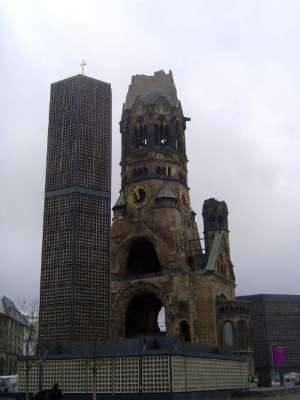 The entrance tower of the Kaiser Wilhelm Memorial Church, or Kaiser-Wilhelm-Gedachtniskirche, built in the 1890s, has been left as it was in 1945. 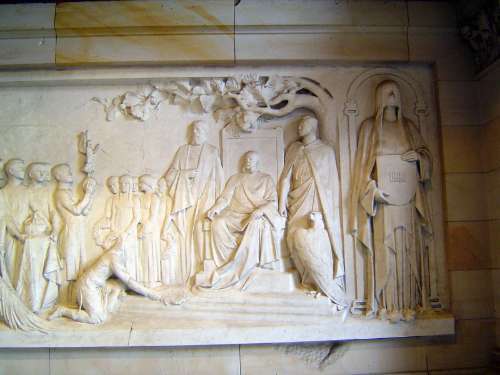 Also in the surviving entrance hall is this relief of Kaiser Wilhelm receiving homage as Emperor. He sits beneath an oak tree. Wilhelm II, then a prince, stands next to the imperial eagle. A great grandson kneels, while the woman on the right is masked in mourning for the kaiser's death. The mystique of Greece is still not exhausted.